The sophomore event for Shed Racing took place at NASA's June 25-26 event at Thunderhill Raceway Park, in the GTI Cup class. There were 6 cars in class this weekend, with Tom Aiken handling the driving duties for the whole event. 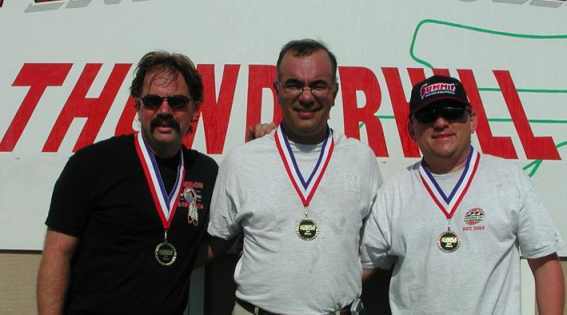 Other competitors included Scott Neville, Joe Craven, Don Bailey, Carlos Suarez, and Dan Piña. This was also a test weekend for a new inexpensive suspension set up, with all the other competitors except Dan Piña using a coilover setup with stiffer springs with the spec Bilstein shocks. The test results were excellent, the cars were faster for not much more money. 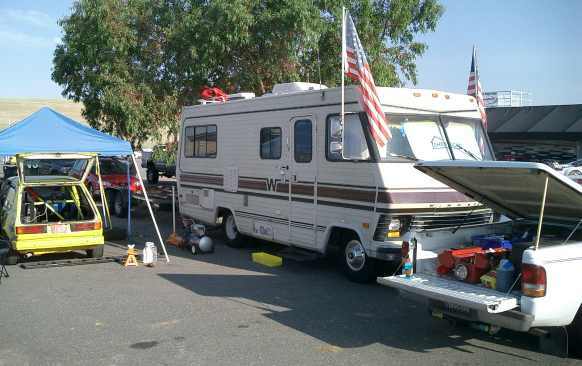 The Miller Motorsports guys again set up next to us in the paddock. Ron reviews telemetry from the morning warm-up, and uploads the qualifying engine map. Tom got a fair start on Saturday, with a best time in the morning warm up of 2:21.4, about a half second faster than his best time at the last event, but still 2 1/2 seconds slower than the next faster competitor, Scott Neville. 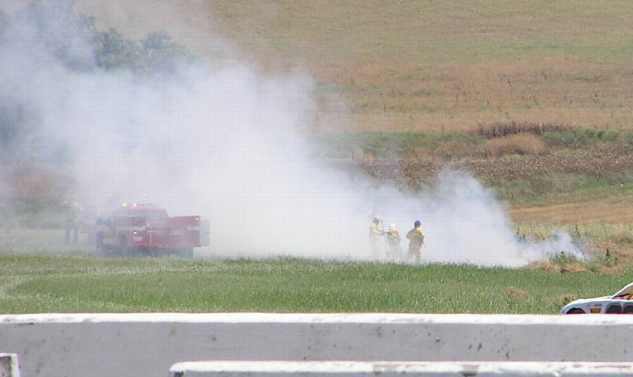 The Qualification session started with a grass fire in turn 6, the result of an off track excursion by a Mazda. Tom continued to show some improvement, with the best lap dropping a half second to 2:20.9, though still lagging 2.6 seconds off the pace of the next fastest competitor, Dan Piña, putting him last on the grid of the GTI class. 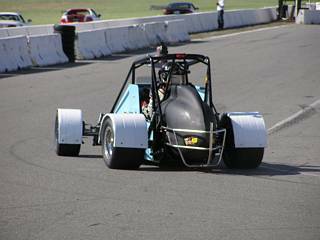 Joe Craven sat on the pole, with a qualifying time of 2:15.06. Ron and Tom with some of the Miller Motorsports guys. Ron left the track Saturday evening, to do some reconnaissance of Sears Point raceway for the upcoming August Event. The gang from Miller Motorsports chipped in to crew for Tom on Sunday. Tom lines up behind Marcus on the grid. The Sunday morning warm-up session was uneventful, with Tom lining up on grid behind Marcus and chasing him the entire session. The last half of the session was surreal, in that Marcus and Tom were stuck behind what appeared to be a World of Outlaws Sprint Car (~650 Horsepower, ~1500 Lbs, on 12" wide slicks) that couldn't get out of it's own way in the corners, but would open about 30 car lengths on the straights. Click here for a short video, (4MB WMV file) Tom took a huge bite out of his best lap time, dropping nearly 2 full seconds, to 2:18.38. The grid for the Sunday qualifying race was set by finishing position in the Saturday race, so Tom was set to start fourth, but ended up rolling out fifth after some confusion with the grid workers. The start was much improved over Saturday but again not uneventful with a Porsche 944 and a RX-7 coming together and the 944 spinning into the same hapless MR2 from the Saturday incident. Tom was able to keep up with his competitors into the third laps until he got stuck behind a Factory Five Cobra. Tom struggled to get around the cobra for a little over a full lap, watching the rest of his class slip into the distance. 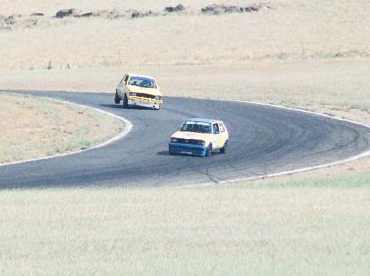 When he finally got around the Cobra in turn 6, the GTI field was between 7 and 8. Mechanical Gremlins showed again, with Scott Neville and Don Bailey both retiring with mechanical problems. Joe Carven finished first, with Carlos Suarez second, and Dan Piña third. Tom finished fourth, with the best lap time nearly flat, at 2:18.4. Overall position was 30 out of 48. The Sunday Race grid was again set by finishing position in the qualifying race, which put Tom on the outside of row 2. The flag dropped, and Tom got an outstanding start, pulling ahead of Dan who started inside him on the same row, and entering turn 1 neck and neck with Carlos, tied for second place. Tom and Carlos continued side by side into Turn 2, where he got stuck behind a slow RX-7 taking an outside line. With no way to pass the slower car on the outside, and no room to slip into the line of GTIs taking the inside line, Tom dropped back to last in class. On Lap 4, Tom started closing the gap on Dan Piña, who was fifth place in class, cutting a few tenths each lap, until they were nose and tail in lap eight. Dan was faster in some parts of the track, but Tom was able to put pressure on for a lap and a half, finally making the pass on the inside going into turn 6. Dan had the better line through the corner, and with his higher exit speed was able to regain his position on the next corner. Going up the hill into Turn 9, the Super Unlimited class leader passed Tom on the inside to put him a lap down, and his horrible line into 9 forced Tom to slow considerably, allowing the gap to Dan to open. The SU class leader only had a one minute lead over the second place car in his class, and when the two GTIs racing for position in front of him swap positions twice in two corners on the last half of the last lap, his only logical course of action would be to get between them. Waiting one more turn, where he could pass both cars easily without interfering with their close race, now that's crazy talk. With the increased gap between Dan and Tom there was no chance of catching him before Dan took the Checkered flag. Joe Craven was again the winner, followed by Don Bailey and Carlos Suarez. Tom finished Last in class, 36th out of 43 overall. The best lap time slipped a bit, to 2:18.7. 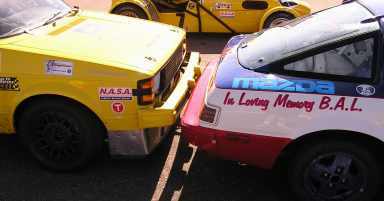 After the race, it was learned that Dan was getting low on fuel, and his engine was starting to sputter on right turns. Overall it was an outstanding weekend. The weather was nice, the car ran great, all we had to do was add fuel and check the oil. 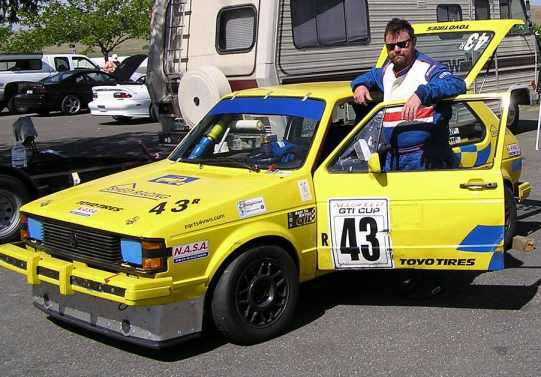 Tom's lap times were only slightly slower than the similarly prepared car, driven by Dan Piña, and comparable to times driven by the other equally prepared GTIs at past events. Considering it was only the second race weekend, finishing at the back of the pack is expected. As an added bonus, the 3 race format of the weekend allowed Tom to get his last three novice races signed off by the race director, completing his Novice Permit, and earning him his competition license.